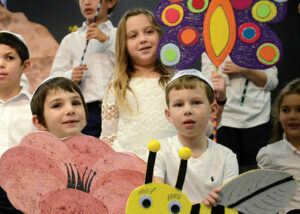 Cincinnati Hebrew Day School, Rockwern Academy, and Ohr Torah Cincinnati. It’s not that schools in Cincinnati are cheap or provide lesser services. We just happen to live in a city that is fortunate to have both a Jewish Foundation and a Jewish Federation that have a lot of money, and they help subsidize the cost of education in order to make it affordable for families, especially families who otherwise might not send their children to Jewish schools. Additionally, because most Orthodox Jews in Cincinnati live in Amberley Village, the State of Ohio gives each child in Kindergarten and above a $4,650 scholarship to attend the private school of their choice (and $6,000 for High School!). The average family spends around $20,000 a year per child on tuition and fees at Jewish day schools around the country. Thanks to the double whammy of our generous Jewish philanthropy groups and the Ed Choice scholarship, our tuition bill in Cincinnati comes in at under $6,000 per child (this can vary depending on what school you choose to send your children to.) That is a ridiculous savings of $14,000 a year! What is the Ed Choice scholarship and why does living in Amberley Village qualify us to receive it? Amberley is located in the Cincinnati Public Schools District, which according to State standards and testing, is considered a failing district. Because of this classification, all residents assigned to this district are given the option of choosing alternative schooling for their children. It is completely coincidental that our Orthodox Jewish community falls into this category of residents who can receive scholarships from the State for private school education. Applications for the scholarship are only accepted at certain times of the year so it is very important that should you choose to move to Cincinnati, you are aware of the guidelines involved in applying for the scholarship or you could potentially land yourself in a situation where you do not qualify. If you move to Ohio mid-year and enroll in school, you will NOT be eligible for the scholarship the following year. You need to reapply each year. If you do not meet testing and/or attendance requirements, you could potentially lose the scholarship.